Have you experienced the spicy and warm effects of cassia essential oil? Similar to cinnamon, this essential oil shares many benefits with its sister oil, however, some prefer the flavor of cassia as it is sweeter and has some of its own unique benefits. Cassia actually belongs to the same family as true cinnamon and both have a pleasant, warm and spicy aroma. However, cassia bark oil is richer and sweeter than its cousin. Often referred to as Chinese cinnamon, cassia is considered to be one of the 50 known herbs commonly used in traditional Chinese medicine. Cassia essential oil is steam distilled from the barks, leaves, and twigs of an evergreen tree native to Myanmar and China. The use of cassia essential oil dates back to even biblical times, used as a part of a recipe in the Holy Anointing Oil gifted to Moses. This holy blend contained olive oil and cassia, myrrh, calamus, and cinnamon essential oils. That’s not cassia’s only role in the Bible, however. Cassia essential oil was mentioned three separate times directly in the bible while being referred to indirectly a whopping 65 times. The history of cassia essential oil goes back even farther, being documented in one of the oldest known records. This medicinal oil was recorded in The Ebers Papyrus, an ancient book of recipes. Over the centuries, Cassia has been extensively used in folk medicine. Cassia oil has been especially important in Ayurveda – the Indian medicine system. Indian practitioners have noted its expectorant, diuretic and purgative properties. They have used cassia for a wide range of diverse health conditions. These include ulcers, coughs, indigestion, menstrual issues, tuberculosis and even leprosy. The oil is also a popular natural remedy for bronchitis, anemia, and constipation. It has also been used for the treatment of ulcers, excess gas, indigestion, erysipelas, cough, menstrual problems, tuberculosis, and leprosy. This spicy oil has also been used as a natural remedy to treat constipation, anemia, and bronchitis. Cassia’s wide array of uses is what has sustained its popularity throughout the years. Given that this essential oil has existed for centuries, it has racked up quite a bit of uses that still hold up today. From relieving arthritis to fighting bacteria, cassia essential oil will surely find its way into your healthcare regimen. Research has shown that cassia essential oil inhibits the growth of many strands of bacteria, such as the strains responsible for staph infections and illnesses resulting from E. coli. This powerful antibacterial oil is also effective in inhibiting the growth of molds, yeasts, and fungi on the hair, nails, and skin. The antibacterial and antimicrobial properties of cassia essential oil can help treat the symptoms of urinary tract infections, as well as infections of the urethra, kidneys, and colon. The antiviral properties of cassia essential oil make it a great addition to any medicine cabinet. Using this natural antiviral around cold and flu season will give you ample protection while using it during illness will help fight the virus while alleviating symptoms. If your body is in the throes of fighting a bacterial or viral infection, you may be suffering from a fever. Fortunately, cassia essential oil helps to fight these infections while reducing your overall body temperature. The warming effects of this hot oil also gives relief to fever-induced chills. This powerful, healing essential oil is a great sidekick to your immune system. With its antibacterial, antiviral, and fever-reducing properties combined, this powerful essential oil gives a major boost to your immune system. It can help to fight the illness while alleviating such unpleasant symptoms as chills, inflammation, and achy muscles. If you’re fighting an illness, but still have to carry on with your workday, cassia essential oil has stimulating properties, helping to keep your alert and with a clear mind. Cassia essential oil boosts circulation and is a stimulant, making it a powerful opponent against pain caused by arthritis and rheumatism. This pain relieving oil improves blood flow, warming joints ravaged by arthritis and rheumatism. Meanwhile, the anti-inflammatory properties of cassia essential oil help to naturally treat painful arthritis symptoms. The anti-inflammatory properties of cassia essential oil do not just stop with arthritis, however. One study found that a compound found in cassia called cinnamaldehyde not only inhibited the activation of an inflammatory response, but it actively blocked it. 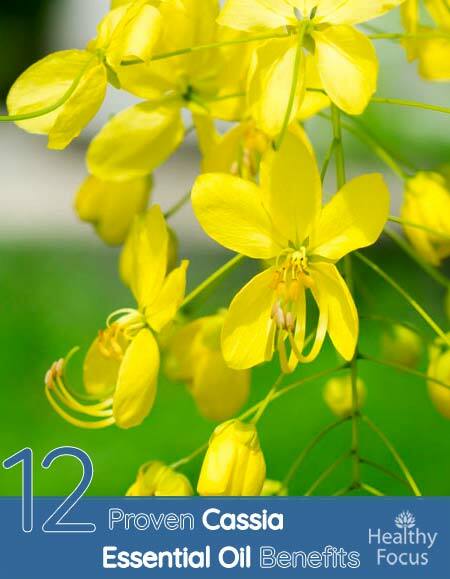 This makes cassia essential oil effective in fighting inflammation in all systems and parts of the body. Cassia essential oil helps stimulate blood circulation throughout the body, delivering nutrients and oxygen to all parts of your body. When your body enjoys good circulation, it not only gets nutrients needed to thrive, but it also helps reduce painful inflammation and muscle aches. It also reduces instances of disease, spreads soothing warmth throughout the body, and encourages urination—effectively ridding the body of toxins. Improving circulation also improves cardiac health, helping to reduce instances of heart attack and stroke. Internally and externally, cassia essential oil is an effective natural astringent. Cassia essential oil promotes the shrinkage of exposed tissues and mucous membranes, regulating the secretion of mucus and blood serum. This makes cassia essential oil a great natural way to treat diarrhea, external hemorrhaging, uterine hemorrhaging, peptic ulcers, and sore throats. The astringent abilities of cassia oil also make it valuable in treating conditions associated with the skin. Cassia can treat rashes and acne naturally while helping to heal cuts, wounds, and rashes. The tightening abilities of cassia essential oil also help to strengthen gums, muscles, and hair. Cassia oil has been used historically to treat various digestive problems including indigestion, constipation, and diarrhea. Cassia essential oil is a natural anti-diarrheal, eliminating toxins, bacteria, and viruses associated with the condition. The fiber content in the essential oil binds bowels to help put a screeching halt to further diarrhea episodes. Cassia essential oil also helps to stop diarrhea by alleviating any inflammation that may be responsible for any gastrointestinal distress. It also has antimicrobial properties that can help fight the germs responsible for your illness. Cramps, fatigue, headaches, bloating, moodiness, and muscle aches are common menstrual symptoms. Fortunately, cassia essential oil contains many properties that help address these common yet painful problems. Cassia essential oil also helps to keep your menstruation on schedule by clearing blocked menstrual paths. Sometimes menstrual symptoms can be so severe that they cause nausea and vomiting. Cassia essential oil’s natural warming and anti-inflammatory properties help to treat these unpleasant symptoms. Try massaging some diluted cassia oil into your abdomen and inhaling the oil to relieve your stresses. This warming essential oil helps to promote a feeling of well-being, helping to fight stress and anxiety. This tranquil oil contains a compound called cinnamic aldehyde, which has been found to suppress conditions and behaviors related to stress. Stress is often a major contributor to many illnesses and disease, so it is important to take care of your mental health, as well as your physical health. If you live in an area where you get lots of unwelcome little house guests, then cassia oil may offer some very good news. I live in a part of the world with more than its fair share of mosquitoes. These tiny terrors are responsible for some very serious diseases like malaria and dengue fever. A study published back in 2006 was conducted to examine the effects of cassia oil on repelling the dangerous yellow fever mosquito. The four volunteers agreed to be exposed to these mosquitoes under lab conditions. The ability of topical cassia oil to repel the mosquitoes was compared with DEET and several other commercial mosquito repellents. Several studies indicate that cassia oil could naturally treat people with diabetes by reducing their blood sugar levels. Unfortunately, the evidence is inconclusive with other studies finding no evidence that it is effective for the condition. Up to now, the evidence that cassia oil can help treat diabetes and reduce blood sugar levels is mixed. More studies need to be done to confirm its effectiveness or otherwise. Diffuse : If you have a diffuser machine, simply diffuse your cassia oil through the day. Its warm, spicy aroma will help ease your stress and anxiety. Inhale : For colds, flu or other respiratory problems, I recommend inhaling your cassia essential oil. You can inhale directly from the bottle whenever needed or cup the palms of your hands over your nose and mouth. Inhaling cassia oil from a handkerchief can also help ease feelings of nausea and calm down the nerves. Massage : Add a few drops of cassia essential oil to a suitable carrier oil like coconut or jojoba oil. Massage it into your aching bones and joints. A massage with this oil is a great way to treat arthritis pains. Bath Oil : Add a few drops to your bathtub, sit back and relax. Let the wonderful aromas wash away the worries of the day and lift your mood. Cassia essential oil can be safely taken internally when used with caution. When consuming cassia essential oil, start off slowly, using only one drop. The sweet cinnamon flavor of cassia oil works well in tea, coffee, oatmeal, or any dish that would benefit from the warm and spicy taste of cassia essential oil. Cassia essential oil is generally safe for external and internal use, however, before incorporating this essential oil into your healthcare regimen, please speak to your physician to ensure the safety of use. Cassia essential oil is not recommended for the use of pregnant women. Cassia potentially has high levels of coumarin which can act as a blood thinner. Cassia essential oil should not be used for women who are breastfeeding as it may inhibit the secretion of milk. When taken in large amount, cassia essential oil may cause some side effects. Before using cassia essential oil on your skin, be sure to do an allergy patch test. Some people may be allergic to this essential oil. Cassia essential oil may decrease blood sugar levels, so those taking diabetes medications should take extra care when using this essential oil. Consuming large amounts of cassia essential oil may be harmful to the liver. Also avoid using cassia essential oil if you are taking drugs that are harmful to the liver, such as Tylenol.